Most students also complete a master’s in math or computer science while pursuing this Ph.D. The mission of the Computational Science doctoral program is to prepare students for 21st-century research careers in academia, government, and industrial laboratories by emphasizing the key role of computation in the physical, biological, and mathematical sciences. Research-intensive studies in computing, mathematics, and science provide the foundation needed to solve real-world problems across the disciplines. MTSU's program emphasizes both simulation and data-intensive science, giving students the skills they need to model complex systems and handle the huge volumes of data generated in modern scientific experiments. A partnership among faculty from eight different departments results in a unique interdisciplinary education that prepares graduates to adapt and grow as computing systems and scientific research evolves. Most students in the doctoral program can also complete a master's degree in either Mathematics or Computer Science. Computational Science doctoral candidate Vijay Koju worked as a graduate intern at Oak Ridge National Laboratory, simulating how light scatters when it enters a new material. Koju collaborated with Dr. J. Baba and Dwayne John to study the geometrical phase of the backscattered photons, known as the Berry phase, and its applications in depth resolved imaging. “This research has the potential to be used in the early detection of diseases such as skin cancer,” Koju says. He developed a parallel version of an existing Monte Carlo code for light transport in turbid media so that it could fully utilize the super computing resources available at the Oak Ridge lab. Koju is working with MTSU advisor Dr. W. M. Robertson on electromagnetic wave propagation in dielectric multilayer structures with applications in the field of bio-sensing and extraordinary acoustic transmission mediated by Helmholtz resonator, which has potential applications in architectural acoustics. A physics graduate from Missouri’s Truman State University, Koju plans a career as a computational scientist in computational physics. Since computational science involves using computers to solve scientific problems, graduates can work as research scientists in almost any field of science or engineering in industry or government, or at a university. 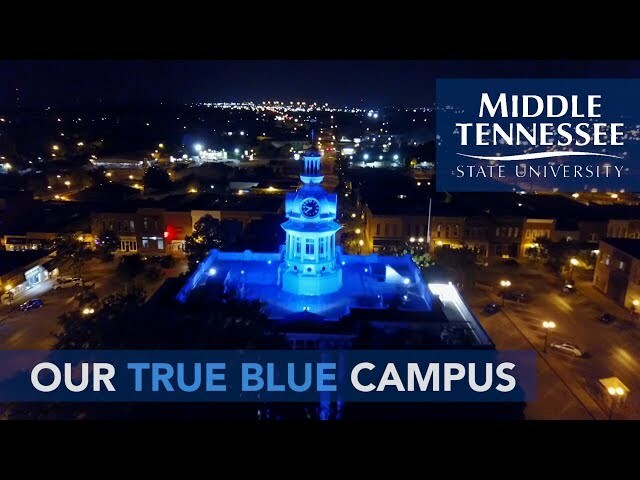 MTSU’s program has focus areas in bioinformatics, biological modeling, computational chemistry, computational graph theory, computational physics, engineering and differential equations, high performance computing, and machine learning and remote sensing. In each of these areas, MTSU faculty and students are working on cutting-edge research projects that cut across traditional departmental boundaries. This information is still being compiled since this is a new degree program at MTSU. The Doctor of Philosophy (Ph.D.) in Computational Science degree is an interdisciplinary research-centered program in the College of Basic and Applied Sciences. Core faculty are from the Biology, Chemistry, Computer Science, Mathematical Sciences, and Physics and Astronomy departments, with other members from Geosciences, Engineering Technology, and Agriculture. The Computational Science Ph.D. program is designed for students who are working toward their doctoral degrees. However, most students in the program are able to complete a master's degree in either Mathematics or Computer Science before they graduate. A few extra courses and requirements are needed to complete the additional degree. This interdisciplinary program is designed to provide unique educational and research opportunities to solve complex problems using numerical solution, computational modeling, and computer simulation. Admission is based on a comprehensive assessment of a candidate’s qualifications including Graduate Record Examination (GRE) scores, undergraduate/graduate grade point average, and letters of recommendation. The application deadline is Feb. 15 for those wishing to be considered for graduate assistantships for the following Fall term. Late applications may be considered, but admission and financial support in the form of an assistantship is not guaranteed. The 72-hour program requires candidates to complete a dissertation; make at least two research presentations at regional, national, or international meetings as the lead or co-author; be lead author or make a significant contribution as co-author of two journal articles; and make a significant contribution to at least one external grant proposal in collaboration with an MTSU faculty member serving as principal investigator. skills in effective written and oral communication so that graduates are prepared to assume leadership positions in academia, national labs, and industry. Admission to the Doctor of Philosophy in Computational Science program is based on a comprehensive assessment of a candidate’s qualifications including Graduate Record Examination (GRE) scores, undergraduate and graduate grade point average, and letters of recommendation. Applicants who do not meet these minimums but whose application materials indicate high potential for success may be admitted conditionally. Such students must meet the conditions of their admission in the time stated to remain in the program of study. The application deadline is February 15 for those wishing to be considered for graduate assistantships for the following Fall. Late applications may be considered, but admission and financial support in the form of an assistantship are not guaranteed. submit an application with the appropriate application fee (online at www.mtsu.edu/graduate/apply.php). provide letters of recommendation from at least three professors or professionals that address the applicant's potential to successfully complete a Ph.D. in the Computational Science program. It is also strongly recommended that prospective students submit a one-page statement of their background and research interests as part of the application. The statement should include a short summary of experience in mathematics, computer programming, and in science along with the types of problems they hope to work on when they join the program. The Ph.D. in Computational Science requires completion of 72 semester hours. make a significant contribution to the development of at least one external grant proposal in collaboration with an MTSU faculty member serving as principal investigator. Prerequisite: Admission to the Computational Science Ph.D. program or permission of instructor. Foundational overview of the mathematical and scientific underpinnings of computational science. Introduces the principles of finding computer solutions to contemporary science challenges. Offers preparation for core and elective courses in the Ph.D. program in Computational Science by reviewing essential mathematical methods and basic science principles drawn from biology, chemistry, and physics. Special topics include techniques of high performance computing and applications, parallel systems, and theory of computation, case studies in computational chemistry, physics, and mathematical biology. Prerequisite: Graduate standing or permission of instructor. Fundamentals of problem solving approaches in computational science, including computer arithmetic and error analysis, linear and nonlinear equations, least squares, interpolation, numerical differentiation and integration, optimization, random number generations and Monte Carlo simulation. Students will gain computational experience by analyzing case studies using modern software packages such as MATLAB. Prerequisite: CSCI 6020 or COMS 6100 with minimum grade of B or equivalent. Advanced introduction to computer systems. Data representations, computer arithmetic, machine-level representations of programs, program optimization, memory hierarchy, linking, exceptional control flow, virtual memory and memory management, basic network concepts, and basic concurrent concepts and programming. Three hours lecture and two hours lab. Prerequisites: [CSCI 3130 and either (CSCI 3240 or CSCI 3250)] or CSCI 6050 and a working knowledge of either C or C++. Parallel processing and programming in a parallel environment. Topics include classification of parallel architectures, actual parallel architectures, design and implementation of parallel programs, and parallel software engineering. Designed for graduate students in Computational Science in order to develop better classroom skills and to build an understanding that good teaching practices can be learned and continuously improved. S/U grading. Prerequisite: Admission to the Computational Science Ph.D. program or permission of instructor. Seminar course to build a broader understanding of problems and research topics in computational science through advanced reading of selected journal articles, group discussion, and presentations by both external and internal speakers in computational science. Prerequisites: COMS 6500 and CSCI 6330 or permission of instructor. Requires students to apply advanced computing and mathematics to solve problems in natural and applied sciences. Students expected to apply parallel computing, advanced simulation and data mining techniques to solve a research problem in collaboration with advisor. Course co-taught by two faculty members from different departments. Final presentations open to students, faculty, and visitors. Prerequisite: Consent of instructor. Intense lecture and practice-based course in computational methods, with a research program offered. Possible topics include computational aspects of linear algebra; contemporary numerical methods (finite difference-based and boundary integral equation-based) for solving initial and boundary value problems for ordinary and partial differential equations arising in engineering, natural sciences, and economics and finance. Prerequisite: COMS 6500 or permission of instructor. Numerical methods for solving ordinary and partial differential equations, partial differential integral equations, and stochastic differential equations. Convergence and stability analyses, finite difference methods, finite element methods, mesh-free methods and fast Fourier transform also included. Prerequisite: Fundamental courses in the Computational Science Ph.D. program and CSCI 6020 or equivalent or consent of instructor. Introduction to concepts, theories, techniques, issues, and applications of data mining. Data preprocessing, association rule analysis, classification analysis, cluster and outlier analysis, deviation detection, statistical modeling, consideration of emergent technologies. Prerequisites: COMS 6100 and STAT 5140 or equivalent. Statistical visualization and other computationally intensive methods. The role of computation as a fundamental tool of discovery in data analysis, statistical inference, and development of statistical theory and methods. Monte Carlo studies in statistics, computational inference, tools for identification of structure in data, numerical methods in statistics, estimation of functions (orthogonal polynomials, splines, etc. ), statistical models, graphical methods, data fitting and data mining, and machine learning techniques. Electives can come from departmental master's degree programs and the COMS program. Selected topics in the natural and applied sciences for Computational Science students. Provides an opportunity to study applications of computational techniques to real world problems and enhance the domain knowledge of students within the program. Rotating topics may include computational chemistry, computational physics, and computational biology. Advanced topics and protocols specific to different subdivisions of computational science not covered in core or elective courses offered through the program. Students will work under the direct supervision of the instructor. Lecture and/or laboratory components. May be repeated for 6 to 8 credit hours. Students must complete 12 hours of directed research before advancement to candidacy. Student may not take more than 6 credit hours of directed research per semester. For Ph.D. students prior to advancement to candidacy. Selection of a research problem, review of pertinent literature, protocol design, collection and analysis of data, and preparation of results for publication. S/U grading. Prerequisite: Advancement to candidacy within the Computational Science Ph.D. program. Involves the student working with their research advisor on any of the aspects of the Ph.D. dissertation from the selection of research problem, a review of the pertinent literature, formulation of a computational approach, data analysis, and composition of the dissertation. Applicants holding a master's degree will be expected to have earned at least 21 semester hours of graduate mathematics, science, or engineering credit with evidence of strong mathematical skills and experience in computation through coursework, employment, and/or research experiences. Applicants applying from the baccalaureate level must have an appropriate science degree with evidence of strong mathematical skills and experience in computation through coursework, employment, and/or research experiences. Students entering with a master's degree in a mathematical, science, or engineering discipline may, on the recommendation of the program coordination committee and with the approval of the graduate dean, have up to 12 credit hours accepted from their master's if it directly corresponds to coursework in the Computational Science curriculum. Students who are interested in pursuing a Master's Degree in Mathematics or Computer Science while pursuing their Ph.D. will need to consult with the program director and the respective departments to understand the additional requirements. Applicants lacking necessary foundational coursework in previous degrees will be required to complete some remedial courses as part of their program of study in addition to the degree requirements. Computation is now regarded as an equal and indispensable partner, along with theory and experiment, in the advance of scientific knowledge. Numerical simulation enables the study of complex systems and natural phenomena that would be too expensive or dangerous, or even impossible, to study by direct experimentation. The quest for increasing levels of detail and realism in such simulations requires enormous computational capacity, and has provided the impetus for dramatic breakthroughs in computer algorithms and architectures. Due to these advances, computational scientists can now solve large-scale problems that were once thought intractable. Computational Science is in a rapidly growing multidisciplinary area with connections to the sciences, mathematics, and computer science. The program focuses on the development of problem-solving methodologies and robust tools for the solution of scientific problems. The Computational Science (COMS) program is a broad multidisciplinary area that encompasses applications in science, applied mathematics, numerical analysis, and computer science. Computer models and computer simulations have become an important part of the research repertoire, supplementing (and in some cases replacing) experimentation. Going from application area to computational results requires domain expertise, mathematical modeling, numerical analysis, algorithm development, software implementation, program execution, analysis, validation, and visualization of results. The COMS program comprises all of the above. MTSU’s program and research includes elements from computer science, applied mathematics, and science. The COMS program focuses on the integration of knowledge and methodologies from all of these disciplines, but is also distinct from the rest. Borodin, V.N. (2013) A Semi-Analytical Approach to Green's Functions for Problems in Multiply-Connected Regions on a Spherical Surface. Journal of Mathematics and System Science, 12, pp 597-601. Gu, Y., Wu, C.Q., Liu, X. and Yu, D. (2013) Distributed Throughput Optimization for Large-Scale Scientific Workflows Under Fault-Tolerance Constraint. Journal of grid computing, 11, pp 361-379. Gu, Y. and Wu, Q. (2013) Performance analysis and optimization of distributed workflows in heterogeneous network environments. IEEE Transactions on Computers. Krakovski, R., Stephens, D.C. and Zha, X. (2013) Subdivisions of K5 in Graphs Embedded on Surfaces With Face-Width at Least 5. Journal of Graph Theory, 74, pp 182-197. Li, C., Dong, Z., Untch, R.H. and Chasteen, M. (2013) Engaging Computer Science Students through Gamification in an Online Social Network Based Collaborative Learning Environment. International Journal of Information and Education Technology, 3, pp 72-77. Li, C., Dong, Z., Untch, R.H. and Jagadeesh, D. (2013) Developing an Interactive Practice Tool in PeerSpace for First Year Computer Science Students. International Journal of Information and Education Technology, 3, pp 48-53. Momm, H.G., Bingner, R.L., Wells, R.R., Rigby, J.R. and Dabney, S.M. (2013) Effect of topographic characteristics on compound topographic index for identification of gully channel initiation locations. Transactions of the ASABE, 56, pp 523-537. Nordberg, E.J., Blanchard, T.A., Cobb, V.A., Scott, A.F. and Howard, R.S. (2013) Distribution of a Non-Native Gecko (Hemidactylus turcicus) in Tennessee. Journal of the Tennessee Academy of Science, 88. Proynov, E., Liu, F. and Kong, J. (2013) Analyzing effects of strong electron correlation within Kohn-Sham density-functional theory. Physical Review A, 88, pp 032510. Reshniak, V. (2013) Some Further Developments in the Infinite Product Representation of Elementary Functions. Global Journal of Science Frontier Research, 13:4. Seo, S.J. and Slater, P.J. (2013) Open Locating-Dominating Interpolation for Trees. Congressus Numerantium, 215, pp 145-152. Shamir, L., Holincheck, A. and Wallin, J. (2013) Automatic quantitative morphological analysis of interacting galaxies. Astronomy and Computing, 2, pp 67-73. Yoo, J.P., Yoo, S., Seo, S., Dong, Z. and Pettey, C. (2013) Teaching Algorithm Development Skills. International Journal of Advanced Computer Science, 3:9. Yousuf, M. and Khaliq, A.Q.M. (2013) An efficient ETD method for pricing American options under stochastic volatility with nonsmooth payoffs. Numerical Methods for Partial Differential Equations, 29, pp 1864-1880. Yun, D., Wu, Q., Gu, Y. and Liu, X. (2013) On an integrated mapping and scheduling solution to large-scale scientific workflows in resource sharing environments. Proceedings of the 46th Annual Simulation Symposium, pp 7. Allen, A., Berriman, B., DuPrie, K., Hanisch, R.J., Mink, J., Nemiroff, R.J., Shamir, L., Shortridge, K., Taylor, M.B., Teuben, P. and others, (2014) The Astrophysics Source Code Library: Where Do We Go from Here?. Astronomical Society of the Pacific Conference Series, 485, pp 477. Bhatt, H.P. and Khaliq, A.Q.M. (2014) Higher order exponential time differencing scheme for system of coupled nonlinear Schrodinger equations. Applied Mathematics and Computation, 228, pp 271-291. Borodin, V.N. and Melnikov, Y.A. (2014) Potential fields induced by point sources in assemblies of shells weakened with apertures. Mathematical Methods in the Applied Sciences. Chellali, M., Rad, N.J., Seo, S.J. and Slater, P.J. (2014) On open neighborhood locating-dominating in graphs. Electronic Journal of Graph Theory and Applications (EJGTA), 2, pp 87-98. Ding, W., Hendon, R., Cathey, B., Lancaster, E. and Germick, R. (2014) Discrete time optimal control applied to pest control problems. Involve, a Journal of Mathematics, 7, pp 479-489. Ding, W., Lenhart, S. and Behncke, H. (2014) Discrete Time Optimal Harvesting of Fish Populations with Age Structure. Letters in Biomathematics, 1:2. DuPrie, K., Allen, A., Berriman, B., Hanisch, R.J., Mink, J., Nemiroff, R.J., Shamir, L., Shortridge, K., Taylor, M.B., Teuben, P. and others, (2014) Astrophysics Source Code Library: Incite to Cite!. Astronomical Society of the Pacific Conference Series, 485, pp 473. Ewool, R.C. and Sinkala, Z. (2014) Analysis on a Mathematical Model for Tumor Induced Angiogenesis. Journal of Applied Mathematics and Physics, 2. Fan, J., Hu, T., Wu, Q. and Zhou, D. (2014) Consistency analysis of minimum error entropy algorithm. Applied and Computational Harmonic Analysis, in press. Koju, V. and Robertson, W.M. (2014) Slow light by Bloch surface wave tunneling. Optics express, 22, pp 15679-15685. Koju, V., Rowe, E. and Robertson, W.M. (2014) Extraordinary acoustic transmission mediated by Helmholtz resonators. AIP Advances, 4, pp 077132. Kuminski, E., George, J., Wallin, J. and Shamir, L. (2014) Combining human and machine learning for morphological analysis of galaxy images. Publications of the Astronomical Society of the Pacific, 126, pp 959-967. Liang, X., Khaliq, A.Q.M. and Sheng, Q. (2014) Exponential time differencing Crank-Nicolson method with a quartic spline approximation for nonlinear Schrodinger equations. Applied Mathematics and Computation, 235, pp 235-252. Martin-Vaquero, J., Khaliq, A.Q.M. and Kleefeld, B. (2014) Stabilized explicit Runge-Kutta methods for multi-asset American options. Computers & Mathematics with Applications, 67, pp 1293-1308. Melnikov, Y.A. (2014) To the Efficiency of a Green's Function Modification of the Method of Functional Equations. Journal of Applied and Computational Mathematics, 3, pp 2. Melnikov, Y.A. and Reshniak, V. (2014) A semi-analytical approach to Green's functions for heat equation in regions of irregular shape. Engineering Analysis with Boundary Elements, 46, pp 108-115. Mirik, M., Ansley, R.J., Steddom, K., Rush, C.M., Michels, G.J., Workneh, F., Cui, S. and Elliott, N.C. (2014) High spectral and spatial resolution hyperspectral imagery for quantifying Russian wheat aphid infestation in wheat using the constrained energy minimization classifier. Journal of Applied Remote Sensing, 8, pp 083661-083661. Pitigala, S. and Li, C. (2014) Extending PubMed Related Article (PMRA) for Multiple Citations. Advances in Data Mining. Applications and Theoretical Aspects, pp 55-69. Plummer, M. and Zha, X. (2014) On a Conjecture Concerning the Petersen Graph: Part II. The Electronic Journal of Combinatorics, 21, pp P1-34. Quinn, T. and Sinkala, Z. (2014) A direct method for computing extreme value (Gumbel) parameters for gapped biological sequence alignments. International journal of bioinformatics research and applications, 10, pp 177-189. Rajan, N., Maas, S.J., Kellison, R., Dollar, M., Cui, S., Sharma, S., and Attia, A. (2014) Emitter uniformity and application efficiency for center pivot irrigation systems. Irrigation and Drainage, in press. Reshniak, V., Khaliq, A.Q.M., Voss, D.A. and Zhang, G. (2014) Split-step Milstein methods for multi-channel stiff stochastic differential systems. Applied Numerical Mathematics. Seo, S.J. and Slater, P.J. (2014) OLD Trees with Maximum Degree Three. Utilitas Mathematica, 94, pp 361-380. Shamir, L. and Wallin, J. (2014) Automatic detection and quantitative assessment of peculiar galaxy pairs in Sloan Digital Sky Survey. Monthly Notices of the Royal Astronomical Society, 443, pp 3528-3537. Shamir, L., Yerby, C., Simpson, R., von Benda-Beckmann, A.M., Tyack, P., Samarra, F., Miller, P. and Wallin, J. (2014) Classification of large acoustic datasets using machine learning and crowdsourcing: Application to whale calls. The Journal of the Acoustical Society of America, 135, pp 953-962. Stephens, D.C., Tucker, T.W. and Zha, X. (2014) Representativity of Cayley maps. European Journal of Combinatorics, 39, pp 207-222. Sun, H. and Wu, Q. (2014) Sparse Representation in Indefinite Kernel Machines. IEEE Transactions on Neural Networks and Learning Systems, in press. Teuben, P., Allen, A., Berriman, B., DuPrie, K., Hanisch, R.J., Mink, J., Nemiroff, R.J., Shamir, L., Shortridge, K., Taylor, M.B. and others, (2014) Ideas for Advancing Code Sharing: A Different Kind of Hack Day. Astronomical Society of the Pacific Conference Series, 485, pp 3. Voss, D.A. and Khaliq, A.Q.M. (2014) Split-Step Adams-Moulton Milstein Methods for Systems of Stiff Stochastic Differential Equations. International Journal of Computer Mathematics, pp 1-18. Williams, A., Wallin, J., Yu, H., Perale, M., Carroll, H., Lamblin, A., Fortson, L., Obbink, D., Lintott, C. and Brusuelas, J. (2014) A Computational Pipeline for Crowdsourced Transcriptions of Ancient Greek Papyrus Fragments. IEEE International Conference on Big Data, in press. Williams, A.C., Carroll, H.D., Wallin, J.F., Brusuelas, J., Fortson, L., Lamblin, A. and Yu, H. (2014) Identification of Ancient Greek Papyrus Fragments Using Genetic Sequence Alignment Algorithms. 10th IEEE International Conference on e-Science, in press. Wua, Y., Yeb, D., Zanga, W. and Zhangc, C. (2014) Nowhere-zero 3-Flows in Signed Graphs. SIAM Journal on Discrete Mathematics, 28, pp 1628-1637. Xiong, L. and Hong, D. (2014) Multi-resolution Analysis Method for IMS Data Biomarker Selection and Classification. British Journal of Mathematics and Computer Science, accepted. Bhatt, H.P. and Khaliq, A.Q.M. (2015) The locally extrapolated exponential time differencing LOD scheme for multidimensional reaction-diffusion system. Proceedings of the 2015 Joint Mathematics Meetings. Liang, X., Khaliq, A.Q.M. and Xing, Y. (2015) Fourth Order Exponential Time Differencing Method with Local Discontinuous Galerkin Approximation for Coupled Nonlinear Schrodinger Equations. Communications in Computational Physics. The Faculty in the Computational Science Program at MTSU have a diverse set of research interests that cross between traditional departmental boundaries. The groups below outline some of the core research interests of our faculty. In some cases, faculty straddle two or more of the areas below. However, for simplicity, faculty are only associated with a single group on this page.